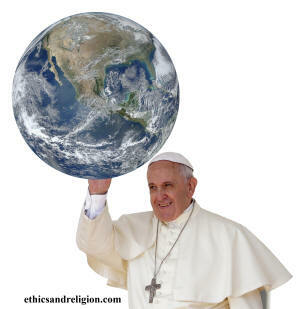 "The earth, our home, is beginning to look more and more like an immense pile of filth," said Pope Francis in his moving encyclical "Laudato Si," the opening words of an Italian song by St. Francis: "Praise Be to you, my Lord, through our Sister, Mother Earth, who sustains and governs us, and who produces various fruit with colored flowers and herbs." Suburban America does not look like a pile of filth. However, last week the Pope purposely traveled in South America to Banado Norte, a shantytown on the banks of the River Paraguay where 100,000 squatters live in shacks of plywood and corrugated metal, to encourage the residents' faith despite their difficulties. Heavy rains regularly make the river burst - turning Banado Norte's dirt streets to impassable pools of mud. Francis said he wanted "to see your faces, your children, your elderly, and to hear about your experiences and everything you went through to be here, to have a dignified life and a roof over your heads, to endure the bad weather and the flooding of these last few weeks." Francisca de Chamorra, 82, replied, "Now I can die peacefully," after having lived in the slum since 1952. "It's a miracle that a pope has come to this muddy place." In "Laudato Si" the pope critiques consumerism and irresponsible development and calls for "swift and unified global action" to combat environmental degradation and climate change also known as global warming. The New York Times called it "sweeping in scope." Francis describes a relentless exploitation and destruction of the environment for which he blamed "apathy, the reckless pursuit of profits, excessive faith in technology and political shortsightedness." The Times editorialized that the document "packed an unexpectedly authoritative and confident punch, especially on global warming: 'Climate change is a global problem with grave implications: environmental, social, economic, political and for the distribution of goods,' he wrote. 'It represents one of the principle challenges facing humanity in our day.'" Scientists are virtually unanimous on the threat of global warming which can be seen in melting glaciers and ice in the Arctic and Antarctic. Francis correctly blames our burning of fossil fuels as the source of much of the crisis. And he argues the hardest hit will be the poorest people of the poorest countries, those least able to adapt to rising seas and devastating floods. The timing of "Laudato Si" is brilliant – only months before delegates from nearly 200 nations will gather in December in Paris to attempt to agree upon a global strategy that would commit all countries to reduce their emissions of carbon dioxide and other greenhouse gases. Some countries such as the United States and Europe have already published their pledges. President Obama has set a goal of reducing America's greenhouse gas emissions by 26% below 2005 levels by 2025. However, Republicans in the House and Senate have passed bills that would make it impossible to reduce emissions from coal-fired power plants – the major strategy to reach that goal. After all, Sen. Mitch McConnell, Senate Majority Leader, is from Kentucky, a big coal producer. However, Pope Francis errs in one major respect. He makes no mention of the fact that it is the industrialization of the world that has lifted billions out of poverty. China alone has reduced those living in severe poverty (under $1.25 a day) by 627 million from 1981 to 2005. The average increase in China's Gross Domestic Product has been 9.9% over the past decade – the fastest growth per capita ever achieved by a major country in human history. In 1981 there were 972 million people in China living on less than $2 a day or $60.00 a month. That figure was reduced to only 362 million in 2009. By contrast, the number of people living in such extreme poverty outside China increased by 50 million. For example, the numbers living in Sub-Saharan Africa on $2 a day grew from 202 million in 1981 to 361 million by 2008. In Latin America, they fell by only 6 million people and by 3 million in East Europe. In East Asia excluding China, the numbers dropped by 124 million. However, the Pope deserves credit for saying the earth "groans in travail" (Romans 8:22). "We have forgotten that we ourselves are dust of the earth (cf. Genesis 2:7)…St. Francis is the example par excellence of care for the vulnerable and of an integral ecology lived out joyfully and authentically."